The Clyde bar is located in Helensburgh on the west coast of Scotland, 25 miles west of Glasgow. The family run pub has been on the go since 1988 and is an easy-going place where all kinds of people of all ages drink and socialise. 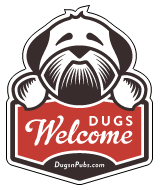 DUGS O’ ALL SIZES WELCOME!